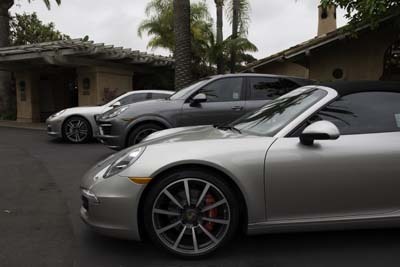 I didn’t think twice when I saw three Porsches and a Bentley parked in front of the clubhouse at Rancho Valencia, the Relais & Chateaux resort in the southern California community of Rancho Santa Fe. Here in the hills behind the Del Mar Racetrack, stately mansions and horse farms are commonplace, and so are expensive cars. These three Porsches, however—a 911 Carrera, a Cayenne GTS, and a Panamera S Hybrid—do not, unlike the Bentley, belong to any of the guests: They are loaners, available for any guest to take for a spin through the hills or a trip down to the beach at no cost. Just sign a waiver agreeing that your insurance carrier is responsible for primary coverage and you’ll be handed the keys. Not surprisingly, a resort that’s happy to let you drive around in one of its Porsches for free isn’t about to start imposing surcharges most of its amenities. WiFi is free, so is court time, access to the spa, participation in all 75 fitness classes, the fresh-squeezed orange juice and newspaper delivered to your door each morning, and even items in the mini bar and use of a set of Callaway golf clubs. You do have to pay for food, drink, and spa services, of course, but Rancho Valencia has otherwise taken the enlightened attitude that guests should be made to feel like, well, guests. And that certainly extends to the tennis courts, where former U.S. Open Women’s Doubles and Mixed Doubles Champion Robin White now heads up the program. Next: Rancho Valencia’s 25 years of tennis history.